This Safe, Simple, Small but Fast POE Ethernet Switch with multifunction. HC1709PE is suitable for IP security cameras, but also works with wireless access points, VoIP phones, and other devices that use power over Ethernet. 1. 9-Port 10/100M Desktop PoE Switch (one uplink port and 8 PoE ports). 2. Support PoE power up to 15.4W/30W for each PoE ports. 3. VLan functin, to prevent the invasion of network storm. 4. Power Intelligent Management function. Protect switch and terminals better. 5. Advanced auto-sensing algorithm. Supply industry standard IEEE 802.3af/at power. Safe and Reliable: Data transfers are significantly safer and faster. Power detection Protection. Quiet fanless design. LIFETIME technique service. Simple: Well constructed, trouble-free plug n play. It works like a champ. No set-up required, just plug it in and go. Connectivity to your router or modem for additional wired. You can wall mount it or put it under or the furniture/desk. Small but Fast: High speed switch with metal case. It can handle extreme speed with flawless connection. The small size make the switch can fit nearly anywhere. It takes up very little space. Each port produces full speed to your internet capacity. Small design and nice looking POE switch. Sturdy: Rock solid dependability. 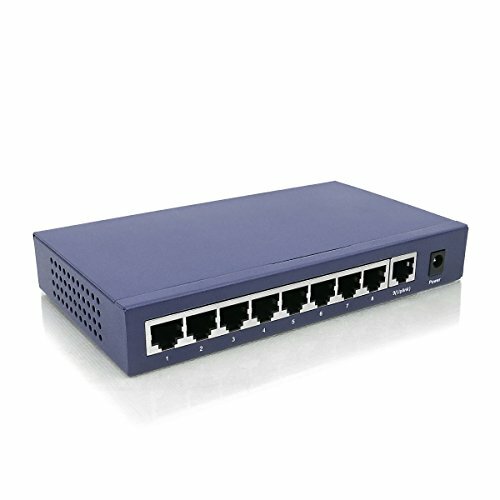 Best Ethernet switch for business and home using. Functionally: Featuring eight Power Over Ethernet (PoE) ports and one uplink port, the switch can provide 15.4 W of power per port to a variety of devices. All 8 ports are POW capable. It provides solid power to all ports and network connectivity points (laptop, camerer, printer, etc) & perfect for gaming and TV fans. The xb360, xbone, ps3,ps4, TV and media devices all wrok flawlessly with this unit.